Have You Heard the Sheep? The Sheep are Coming Back! SHEEP – Just wanted to let everyone know that The Forest Service will begin their annual Fuel Reduction Project in which they use sheep to graze west of ArrowCreek on Forest Service land. They anticipate starting the project the first of April. The sheep will not be grazing on ACHOA property. They will only be grazing on Forest Service land. Happy grazing! Grazing will happen at several places including Arrowcreek, Thomas Creek and White Creek. Re-posted on behalf of the Humboldt-Toiyabe National Forest. Carson City, Nevada. April 4, 2016. As part of a Carson Ranger District Hazardous Fuels Reduction Project, sheep will be placed on two separate grazing units to reduce fuel load by removing fine fuels, including cheatgrass and other non-native vegetation, from National Forest Systems (NFS) lands. 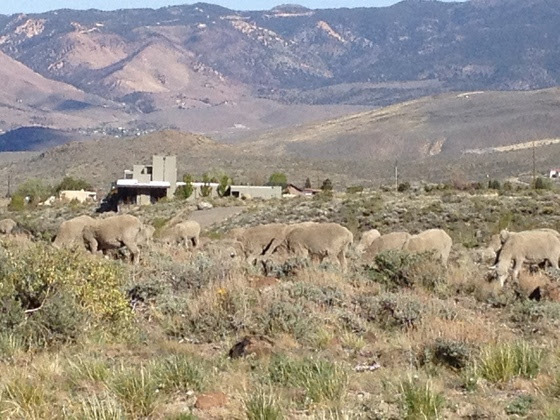 The first unit to be grazed is over 1,000 acres of NFS land located approximately 10 miles southwest of Reno, Nevada, and just west of the Arrowcreek Residential Area urban interface. It will occur within the Thomas Creek and Whites Creek watersheds north of Timberline Road. Grazing will begin April 1 and will continue through the end of the cheatgrass growing season in early summer. The second unit to be grazed is over 500 acres of NFS land located on C Hill just west of Carson City, Nevada, off of Curry Street. Grazing will begin April 7 and will also continue through the cheatgrass growing season. The Forest has contracted with the Borda Land & Sheep Company out of Gardenville, Nevada to perform this grazing project. Approximately 800 ewes will be used for each unit and each flock will be monitored by two herders and their dogs. Water for the sheep will be provided by Nevada Division of Forestry and Carson City Fire Department at predetermined locations. The Humboldt-Toiyabe’s spectacular 6.3 million acres make it the largest national forest in the lower 48 states. Located in Nevada and a small portion of eastern California, the Forest offers year-round recreation of all types. This entry was posted in ArrowCreek 411, ArrowCreek411, Carson Ranger District Hazardous Fuels Reduction Project, Humboldt-Toiyabe National Forest and tagged ArrowCreek, ArrowCreek 411, ArrowCreek411, Carson Ranger District Hazardous Fuels Reduction Project, Cheatgrass, Humboldt-Toiyabe National Forest, Sheep, The Forest Service Annual Fuel Reduction Project, Thomas Creek, Washoe County, White Creek, Whtes Creek. Bookmark the permalink.